Cedar is often knotty, so choose boards with the fewest and smallest knots that you can find. You may need to throw out some pieces with knots (they will break easily), and you can use some shorter pieces for the horizontals. 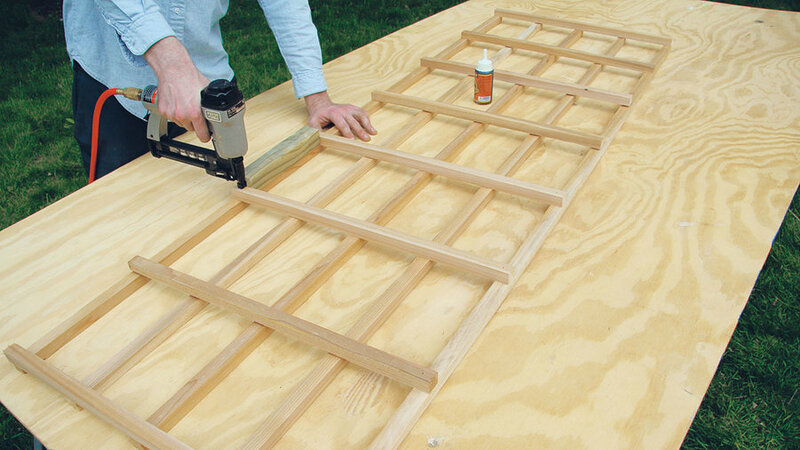 Also choose relatively clear lumber for the frame. The grid shown here is 68 by 22 inches, but you could widen or lengthen it. If you widen it by more than 8 inches, add another vertical lattice piece. 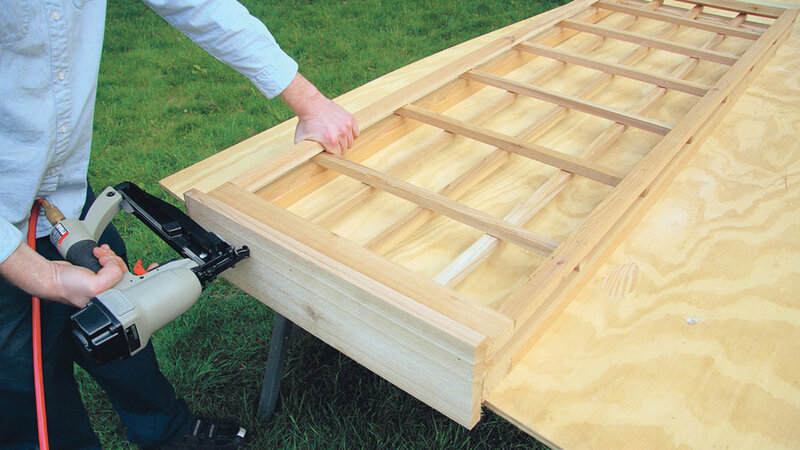 Here we use cedar, but you could use treated lumber, which can be stained or painted. Rip-cut a 5⁄4 by 6 to 2¼ inches wide, and cut four pieces to 22 inches (or longer, if you want a wider panel). Rip four more pieces to 11⁄8 inches wide, and cut them to the desired height of the panel minus 4½ inches. 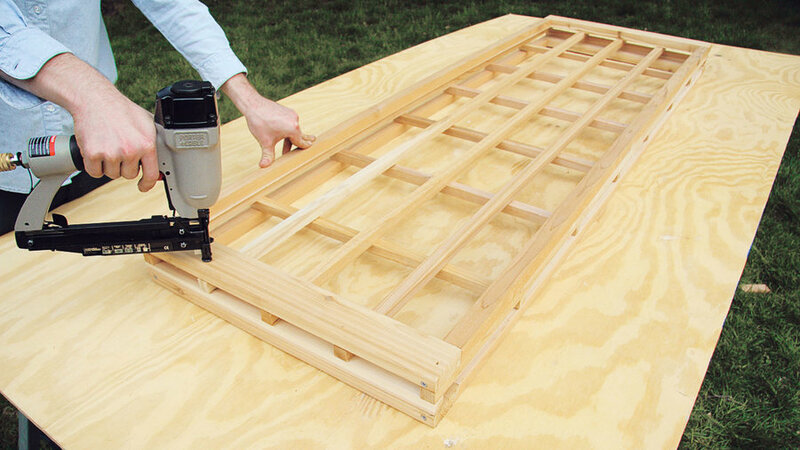 To assemble each frame, place the pieces on a flat surface, check for square, drill pilot holes, and drive a 4-inch screw into each joint. 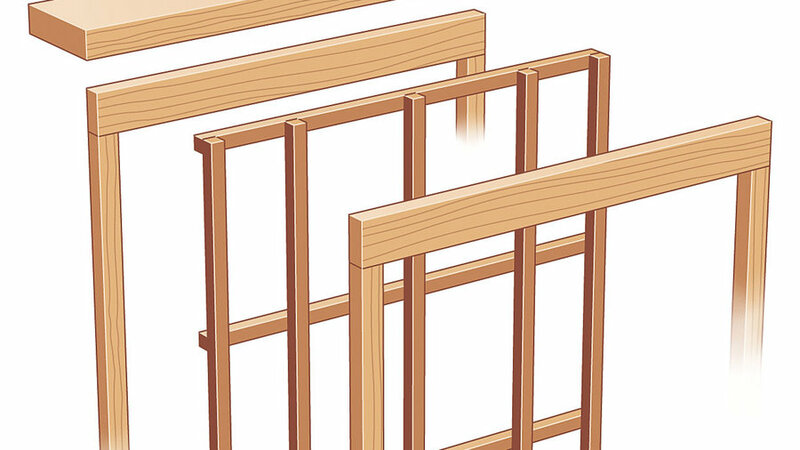 Rip-cut lattice slats to 3⁄4 inch wide. Cut five verticals to the height of the frame and eight horizontals to the frame’s width. Lay the verticals on a flat surface and experiment until you achieve a consistent spacing; cut a scrap board to use as a spacer. Do the same for the horizontals. Check the lattice for square, and fasten each joint by applying a dab of glue and driving a 1¼-inch finish nail or staple. Place the lattice on top of one frame and lay the second frame over the lattice. Check that the edges are close to flush with each other (the alignment probably won’t be perfect), and drive 2½-inch finish nails through the top frame and into the lattice. Turn the assembly over and drive more nails. Cut a 1 by 6 cap rail to the width of the panel. 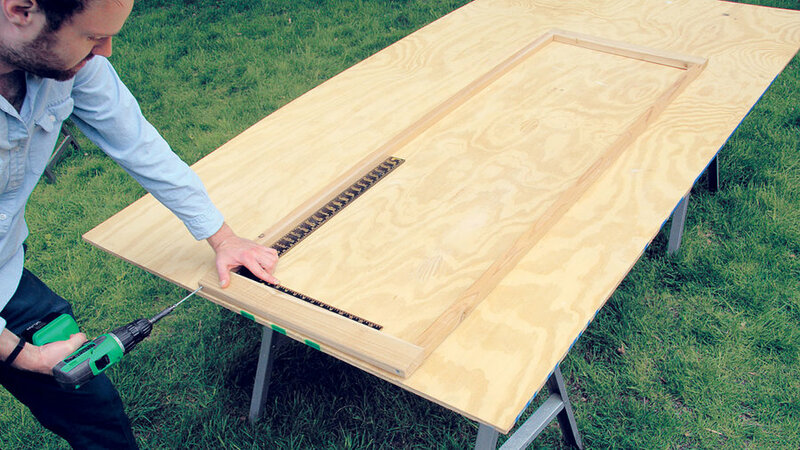 Position it so it overhangs the panel equally on the front and back, and attach it with 2½-inch nails. Seal and stain after the wood is dry. 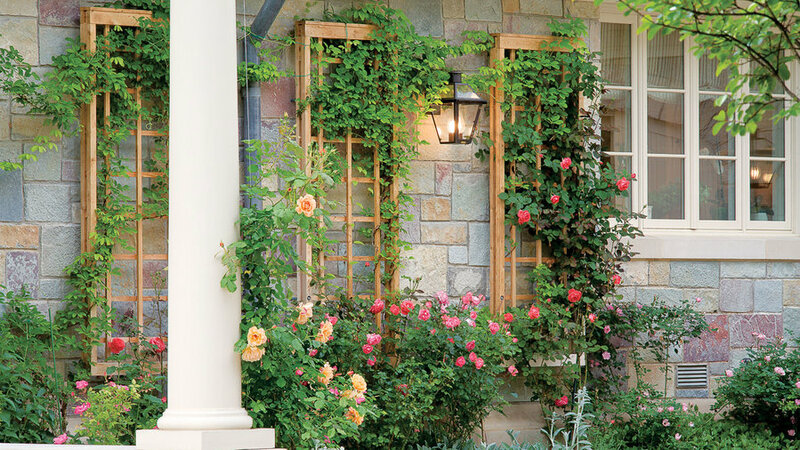 Cut six or eight 2½-inch-long pieces of copper or plastic pipe to hold the trellis away from the wall. Drive screws to attach to a wood surface. 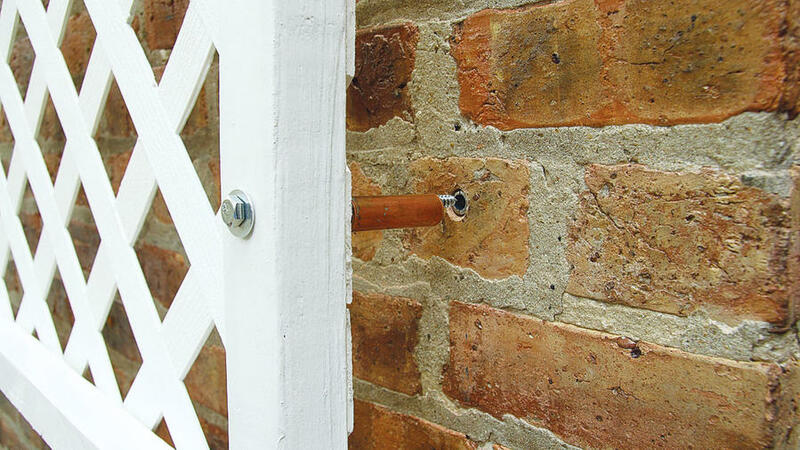 To anchor to a masonry wall, use lag screws and shields.